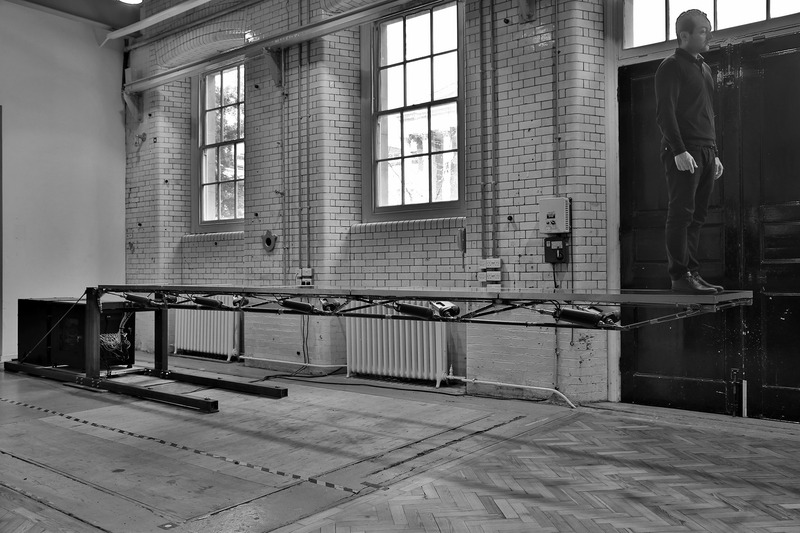 A large scale prototype (figure 8), designed using the methodology described in the previous section, was built at the University College London structures laboratory. The prototype is a 6 m × 0.8 m × 0.16 m (37.5:1 span-to-depth ratio, 75:1 if thought of as simply supported) cantilever spatial truss (figure 9). The truss consists of forty-five passive steel members and ten electric linear actuators strategically fitted within the tension diagonal members. The structure is designed to support its own weight (102 kg including actuators and cladding) and can take a live load of 100 kg at the tip of the cantilever (person walking along the deck). The frame is fully instrumented to monitor the stress in the passive members, the deflected shape and the operational energy consumed by the active elements. The steel members making up the truss have been sized to prevent collapse, but instead of adding more material, the more onerous requirements of deflection and movement are governed by a state-of-the-art control system. Due the fail-safe nature of the actuators, if the power is cut the actuators simply stop moving and load carrying capacity is not compromised. The control system architecture was designed with the primary aim to achieve identification of the response to loading in terms of internal forces and displacements for the structure to be able to be control itself without user intervention nor predetermined knowledge of the external load (whose magnitude must be lower than that of the design load). Figure 10 shows the conceptual schematics for the architecture of the control system. The deformation of each element, monitored using strain gauge-based sensors of type full-bridge (figure 11), together with the stroke position feedback from the actuators are fed into the main controller (strain feedback and position feedback in figure 10). The control algorithm processes the input feedback to first reconstruct the node spatial positions. In case the displacements exceed the imposed serviceability limits, the control algorithm computes the minimum length changes of the actuators that bring the structure back within desired serviceability limits. 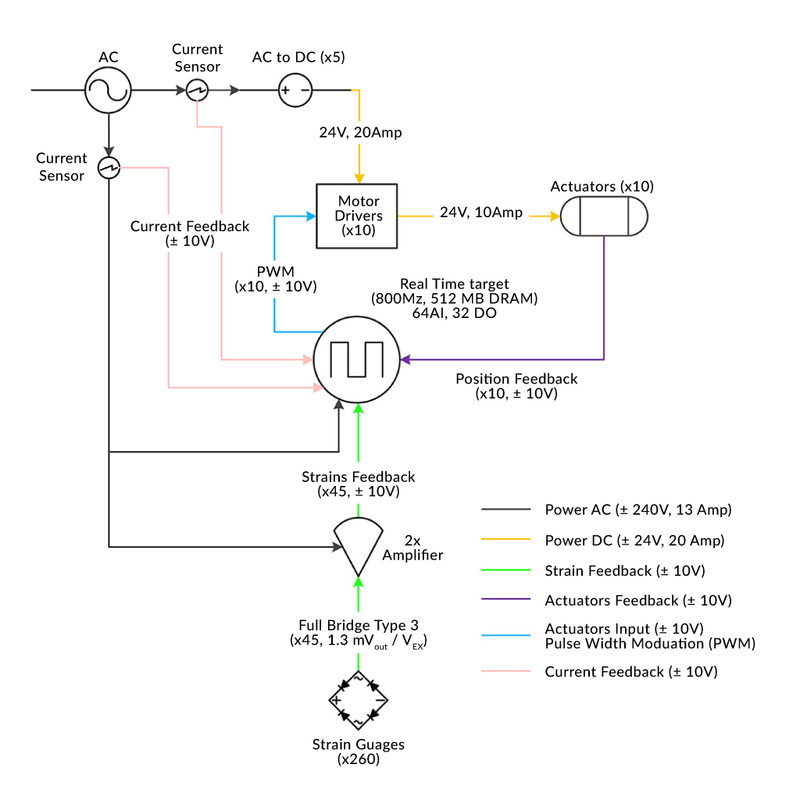 In addition, current sensors are installed at the mains supply to monitor the amount of power being used by the actuators and all the other electronic devices during load control. Extensive loads tests including asymmetric loading causing overall torsion showed that the displacements were practically reduced to zero thus effectively achieving an infinite stiffness structure (zero deflection under loading). 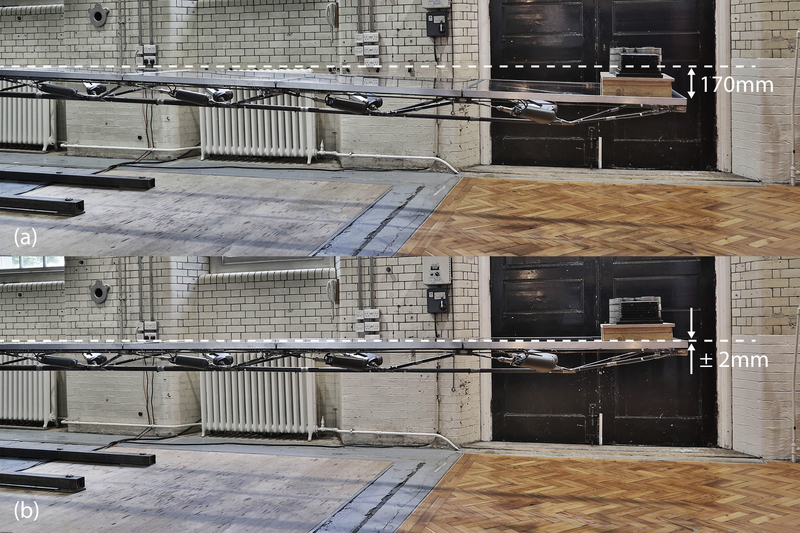 The displacements were measured using a probe and a self-levelling laser which has an accuracy of 2 mm over 30 m. The difference in the vertical position between two consecutive nodes was within ±1 mm and between the supports and the free end nodes within ± 2 mm. Figure 14 shows an example of the difference between the uncontrolled/deformed shape (a) and the controlled shape (b). Similar results in terms of displacements compensation were recorded when a person walked on the deck (video 1). 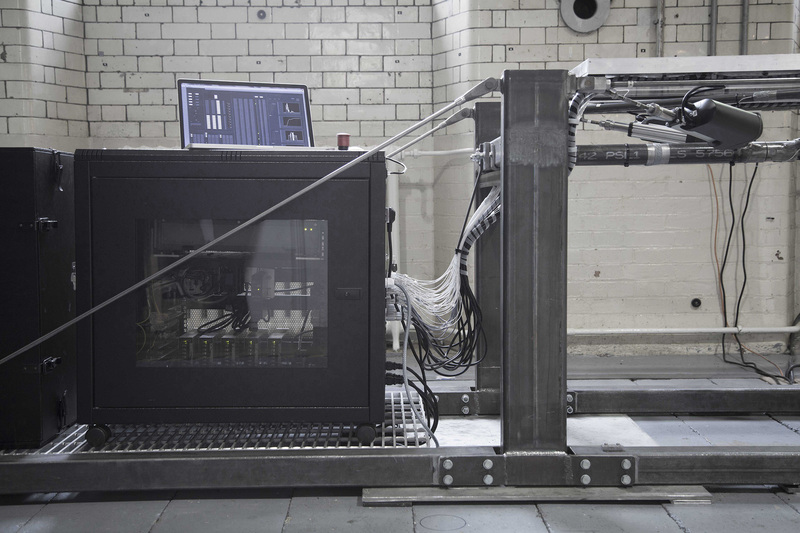 The main objective of this experiment was to gather experimental data to support the claim that adaptive structures allow savings on the total energy of the structure. The external load is modelled using a stochastic distribution which is representative of typical building loading scenarios (design life of 50 years). The limit on displacements is set to span/500 which is normally used as serviceability criteria to limit for the total drift of a high-rise building subjected to wind loading. Due to the pronounced slenderness the structure can be thought of as a scaled version for the super structure of a tall tower subjected to wind load. Power consumption during structural adaptation under loading was recorded for all the electronic devices. 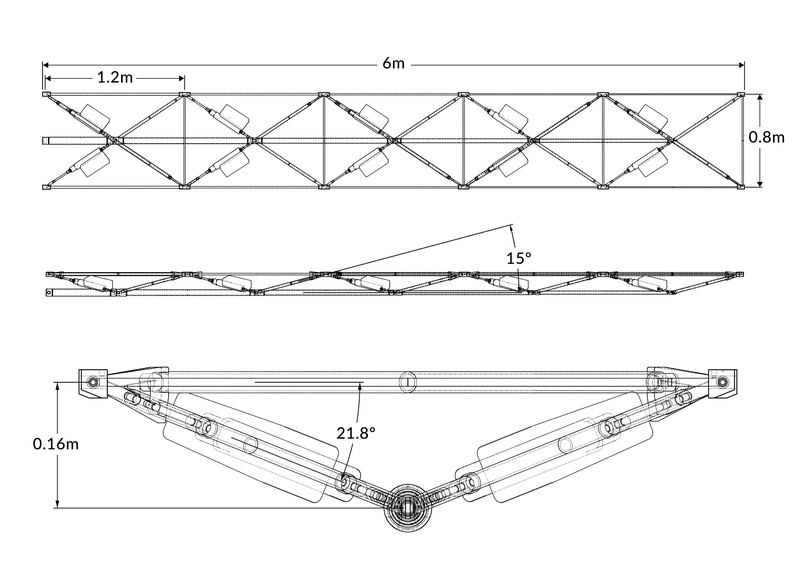 The total energy of the adaptive truss prototype was benchmarked against that of two passive structures (figure 15) designed to take the same loads and to comply with the same serviceability limits used for the adaptive truss. The first structure is made of two steel I-beams, the second is an equivalent truss designed using state-of-the-art optimization methods. 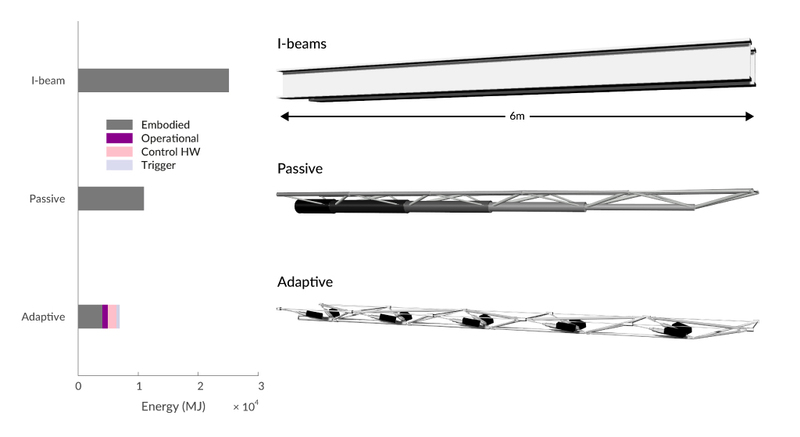 The adaptive truss achieves 70% savings compared to the I-beams and 40% compared to the passive optimised truss. This experiment confirmed that the design method presented in this work is reliable and produces results that are overall conservative and more in general that adaptive structure can achieve substantive total energy savings compared to equivalent passive structures. Stringent, high-performance requirements for deflection, such as laboratory buildings, gantry crane runway beams, and bespoke facades. The structural design is governed by rare, but high loads, such as earthquakes and wind storms. Long-span and high-rise building (skyscrapers, bridges, roofs) would benefit from the three main characteristics of adaptive structures (stiffer, lower weight, slenderer). 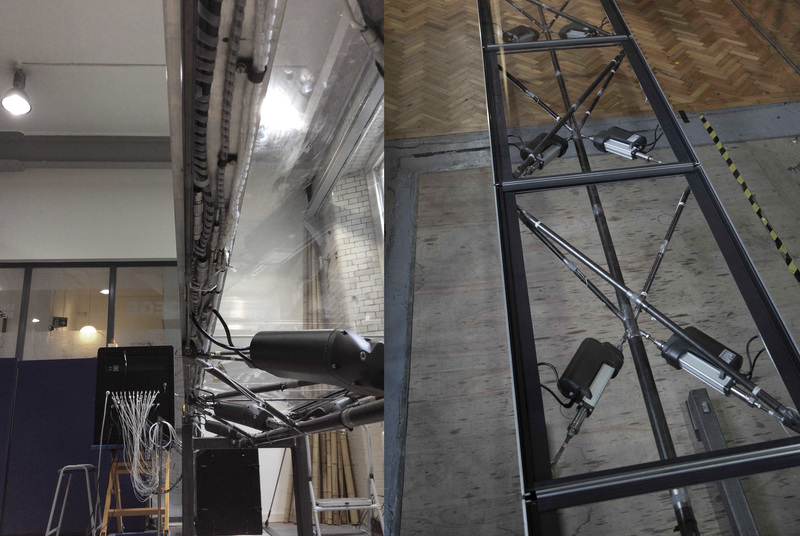 The adaptive truss prototype was exhibited at various key institutions amongst with the University College London, the International Association for Shell and Spatial Structures symposium (IASS) held in Amsterdam in 2015 and The Building Centre (London). The prototype was shortlisted for an IStructE Structural Award 2016.